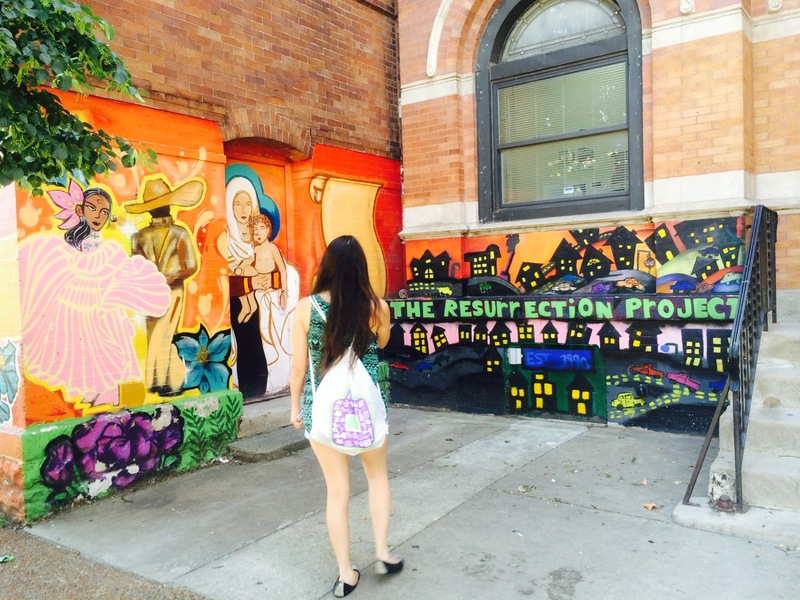 A Loyola student takes a siesta surrounded by Pilsen murals. “In hoc signo vinces,” the motto of Plzen, is printed in colorful lettering on a poster hanging inside of the gift shop in the National Museum of Mexican Art. Translated from Latin, the poster reads, “In this sign you will conquer,” and pays homage to Pilsen Chicago’s Czech roots. Ariana Porras, 27, comments on the makeup of Pilsen from the register of the gift shop as she waits for a customer to decide on a pulsera, a traditional handmade bracelet. Meanwhile, the customer, a bespectacled, bearded man motions towards the red pulsera. Porras rings him up as she continues to talk about Pilsen’s cuisine. A cheery danke schon from the exiting customer throws her off mid sentence, but Porras recovers. The National Museum of Mexican Art sits on 19th Street, with the boundaries of Pilsen running from 16th Street to the north, Cermak Avenue to the South, Halsted Street to the East, and Western Avenue to the west. The museum is surrounded by a variety of Mexican businesses, shops and a public park. New restaurants like La Catrina right on 18th street are joining the ranks of older, more well known restaurants in the area, such as the highly recommended Nuevo Leon, also on 18th street. Both restaurants offer their own take on authentic horchata, flan, tacos and other Mexican specialties. Art galleries open to the public take place every 2nd Friday of the month, and instill a sense of family and belonging into the community. 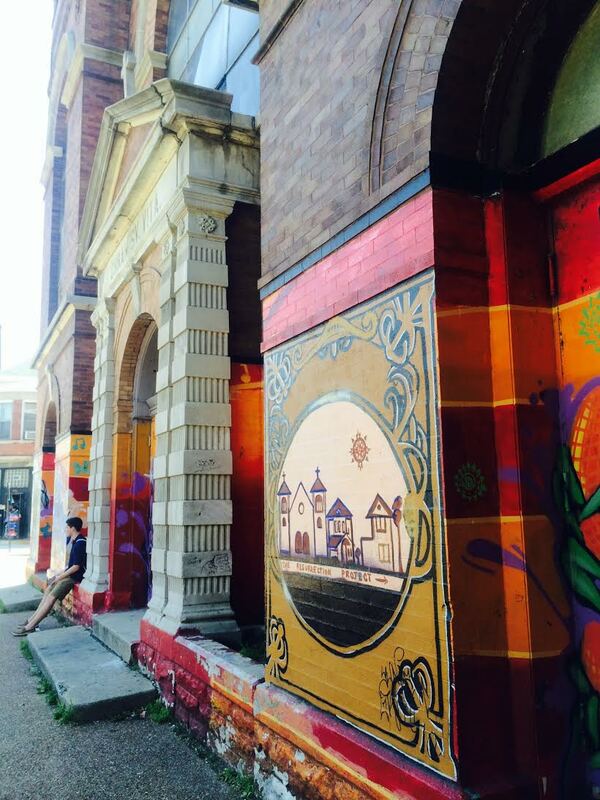 “It’s a win-win for everyone,” Porras comments on the relationship between Pilsen’s older, Hispanic residents and the starving artists who have recently began settling in the area. At first, the residents regarded the artists with some contempt for fear that they would boot them out of their own neighborhood, but as they began opening galleries and beautifying the neighborhood, tensions chilled. “It’s a lot safer now than it was before. There is some change, but it’s good,” Jasmine Alvarez, 17, explains from behind the counter of the Lagos Fruit Market. A Loyola student admires a stretch of wall art. With a population of about 43,000, she says individual faces become almost as recognizable as the vivid murals adorning the sides of many buildings.